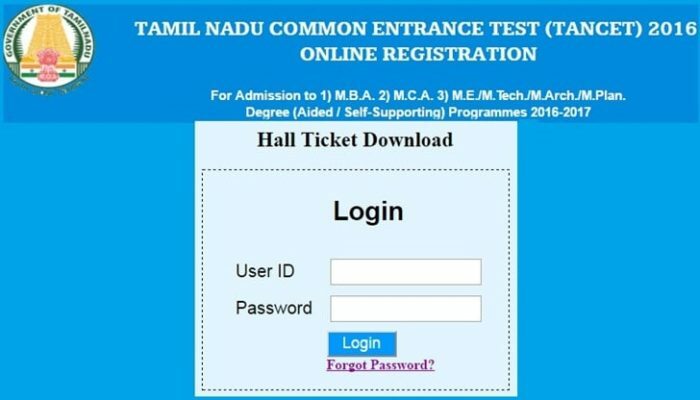 TANCET Admit Card 2016 :- Tamil Nadu Common Entrance Test is scheduled and Admit card is also released for the same. Candidates can download their call letter/hall ticket from the website of the university. Hall ticket has been released from the university and candidates can get the same at website of this prestigious university. Date for Tamil Nadu Post Graduation entrance examinations is scheduled on 11th and 12th June 2016. FRESH UPDATE (06.06.2016) : Hey Guys here is Good News for all those candidates who are interested to attend the entrance exam on the given date then you should download your TANCET Admit Card and Exam pattern syllabus before the exam which is available and the the exam will be held on 11 and 12 June 2016 & link is mentioned below. Anna University is going to held TANCET exam 2016 in upcoming days. Candidates can take admission in various Master degree courses like MCA, MBA and ME. Before getting admission, you must download TANCET Admit Card 2016 which is provided online. Applicants can check out the below mentioned details like Syllabus, exam date, Download Admit Card process, counseling schedule, results. sample paper & much more that will help you in your examination. About TANCET 2016 :- Tamil Nadu Common Entrance Test is abbreviated as TANCET. The Anna University is conducting TNCET examination. It is one of the famous and prestigious universities in state Tamil Nadu. Anna University is well known and one of the most prominent university in India. Most of the students have a dream to get admission and study in the Anna University. Anna University offers so many courses in the different department and various field of study. University matches a world class education technology. Technical institutions are incorporated in the Madras Institute of Technology, College of Engineering, school of architecture and planning, and Alagappa Institute of Technology, etc. English : Verbal Ability, Synonyms & Antonyms, Phrasal Verbs, Idioms & Phrases, One Word Substitutions, Proverbs, Cloze Test, Reading Comprehension, Basic Grammar. Quantitative Aptitude : Algebra, Geometry, Arithmetic, Trigonometry, Permutation & Combination, Statistics, Probability. Data Interpretation : Bar Graph, Histogram, Pie Chart, Line Graph, Problem Based on Equivalence, Problem Based & Percentage. Logical Reasoning : Syllogism, Direction Sitting Arrangement, Coding Decoding, Blood Relation Analogy, Water & Mirror Images, Series, Computer Based Problems, Punch lines. TANCET 2016 Exam Date, Exam Timings & Exam Center :- Selection board of Anna University has decided to organize TANCET 2016 from 11th June to 12th June 2016. This exam will be conducted at various authorized examination centers across the state of Tamil Nadu. Exam date and time will be mentioned on your hall ticket. Centers for Examination are allotted at different cities like Chennai, Salem, virudhunagar tirrucharupalli, Coimbatore, Vellore, Dindigul, Erode, Thanjavur, karikudi, Madurai, Chidambaram, Nagercoil, Tirunelveli, Villupuram. TANCET 2016 Selection Procedure/Process :- Eligible contenders will be shortlisted based on the marks obtained by the candidates in the exam. Shortlisted applicants list will be updated shortly at association official page. The TANCET Admit card is uploaded on official website. The candidates who were interested in getting admission had applied for the exams, they can get their admit card from University’s authorized website. Candidates those who are preparing for the written exam, should be continue towards your study. Candidate need to bring any one of the ID Proof Aadhar Card, Voter Id Card, driving license, Passport with permission letter in examination hall. Carry a copy of it while attend the exam along with valid Id proof. Download TANCET exam 2016 Permission Letter (Available Now). Download TANCET Exam Syllabus 2016. TANCET Admit Card 2016 which is available here. Those candidates who has applied for TANCET Examination 2016, should download Tamil Nadu Common Entrance Test Hall Ticket 2016 before exam date and written exam will be held on 11 & 12 June 2016.